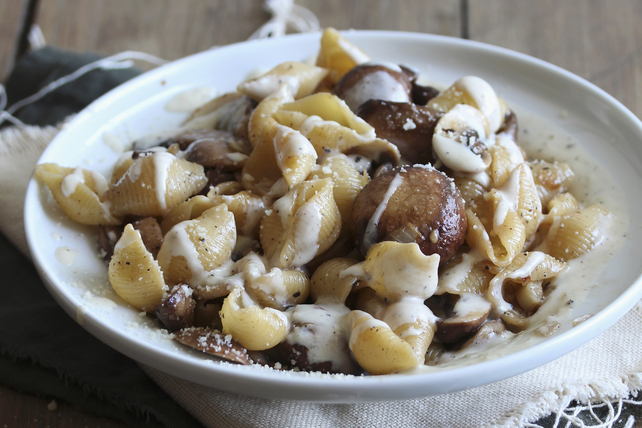 Our Pasta Shells with Creamy Mushroom Sauce is a delicious vegetarian recipe the family is sure to love. Made with cooked pasta shells tossed with an easy-to-make Alfredo sauce flavoured with cooked cremini mushrooms, onions and garlic, this pasta recipe is the perfect dish to serve as part of a busy weeknight dinner. Meanwhile, heat oil in large skillet on medium heat. Add mushrooms, onions and garlic; cook 8 to 10 min. or until vegetables are tender and the mushrooms release most of their liquid, stirring frequently. Drain pasta, reserving 1/4 cup of the cooking water; set pasta aside. Add pasta sauce and reserved cooking water to vegetable mixture in skillet; stir. Cook 5 min. or until heated through, stirring frequently. Add pasta; stir until evenly coated. Top with 2 Tbsp. Kraft 100% Parmesan Aged Grated Cheese before serving. Cool, then refrigerate any leftovers. Reheat before serving as part of a lunch or dinner the next day. Or, freeze up to 2 months before thawing and reheating to serve. Add the reserved 1/4 cup pasta cooking water to the empty pasta sauce jar, then close lid and shake to remove any sauce remaining in jar before using as directed.